$100 Gift Certificate Winner for November! This month’s $100 winner is Ted Lempke, who shared a picture of his new table and chairs on Facebook. 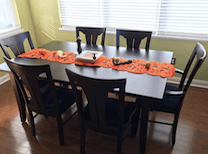 Ted writes, “We love our new dining room set that is all ready for fall!! This was a house warming/wedding present to ourselves!” What a wonderful way to celebrate, Ted! We hope you enjoy many meals and memories with your new furniture. Love your Amish Original? Share a picture or a memory of your furniture and be entered to win! Winners are selected monthly to receive a $100 gift certificate.